This summer was one of the most rewarding and eye-opening experiences I’ve ever had. 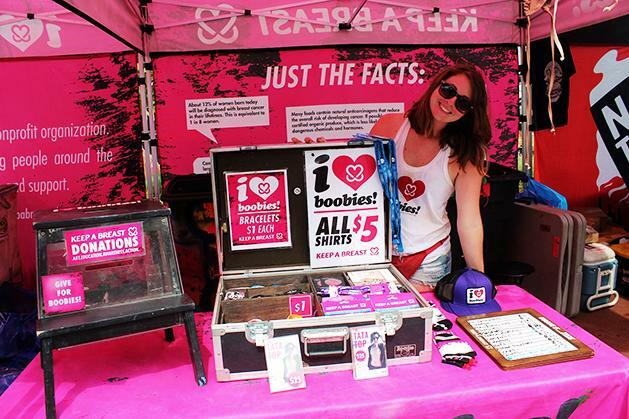 This year I had the pleasure of joining the Keep A Breast (KAB) team out on the Vans Warped Tour. I ran the Keep A Breast Traveling Education Booth and talked to thousands of concertgoers about breast health and education every day. While I am no stranger to the Warped experience, having done the tour years previously with another non-profit, this year was still able to teach me so many new things. The main demographic for Warped Tour falls in the age range of 14-24 years old. Many people look at this generation and think of them as apathetic and caring only about themselves. What I experienced out on the road showed the complete opposite. I had countless young people come up to me interested in what we had to say and even just to thank us for doing what we do because of their personal connection to breast cancer. Every day I would see kids buying I LOVE BOOBIES bracelets for their mothers, aunts, grandmothers, or anyone they know that had been affected. One specific day in Chicago I had a girl tell me her story of when her mother was diagnosed with breast cancer. She was in the salon about to get her hair cut when she learned that her mother was about to start chemotherapy. At that moment she cut off all her hair in support of her mom’s fight. There happened to be another woman standing at the tent who was a breast cancer survivor and was so moved by this girl’s actions that she came over to give her a hug. On another day in New Jersey, I saw out of the corner of my eye two girls wearing bright pink, handmade shirts. I saw the KAB logo on them and had to take a closer look. Turns out they had participated in our fundraiser we did with Pierce the Veil before the tour started. Even though the contest had ended a month prior, these girls were still working hard raising money for Keep A Breast and they were using their shirts to promote their fundraising page. These girls and so many others I met over the summer showed me how wrong people are about this generation. This generation is not selfish or lazy. They are passionate and hard working and have so much love for others. I am ending my summer and taking so much away from all the people I was lucky enough to meet and striving to be more like them.